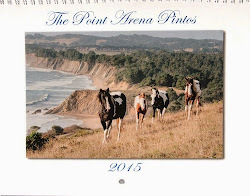 We have for sale a calendar of the pintos! Thunder is such a majestic stallion. I have photographed him many times and it is an ongoing challenge to reveal his true nature in a one photo. He can be very curious, shy, watchful, protective, and intense. When I am feeding all the horses sometimes he stands to the side and other times he gets very close to me. He watches as we pet and hug the colt, and we often get the feeling he would like to be able to allow himself that treat as well. 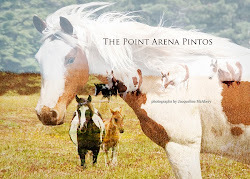 He has only taken a carrot from our hand about 3-4 times in the year that we have been feeding the horses. Each time he was very surprised and startled himself. You know he wants it when we hold the carrot out, because he will nip at another horse if they try to get it. He can seem very sweet at times and of course other times he is clearly in charge! Let me know which image you like the best in the comments section below.